Today James Michael and I went on a 3-mile walk by the river using the Moby wrap. Light exercise + vitamin D for me + nap time for him = an amazing afternoon. There’s just something about being near water that is calming to the soul. We also met Pop and Uncle Pac for lunch. For me, there’s also something about being around family that also calms the soul. James Michael, always the hungry fellow, was eying Pop’s seafood trio. This past weekend was my beautiful sister’s bachelorette weekend. 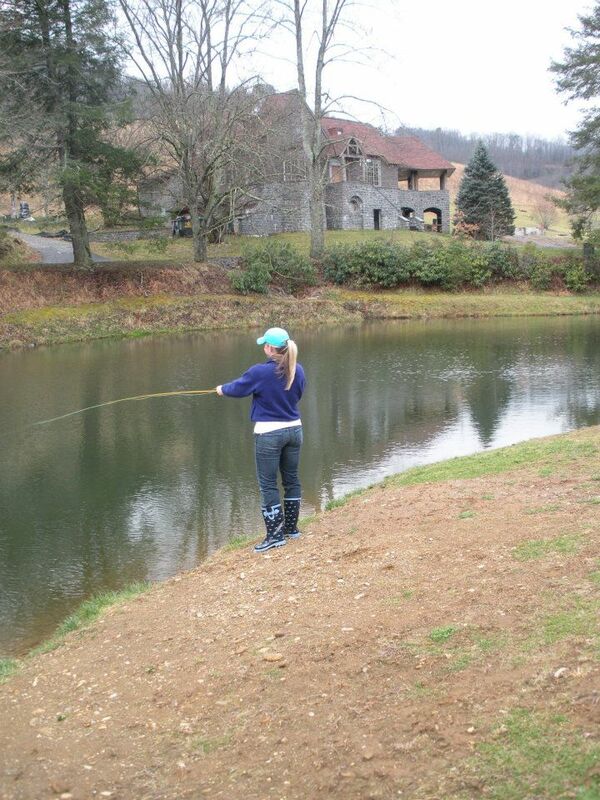 She and a dozen of her closest friends spent the weekend at an awesome cabin in Asheville. As much as I hate I couldn’t have attended, from the looks of the pictures, she had quite an “Ellen” weekend. 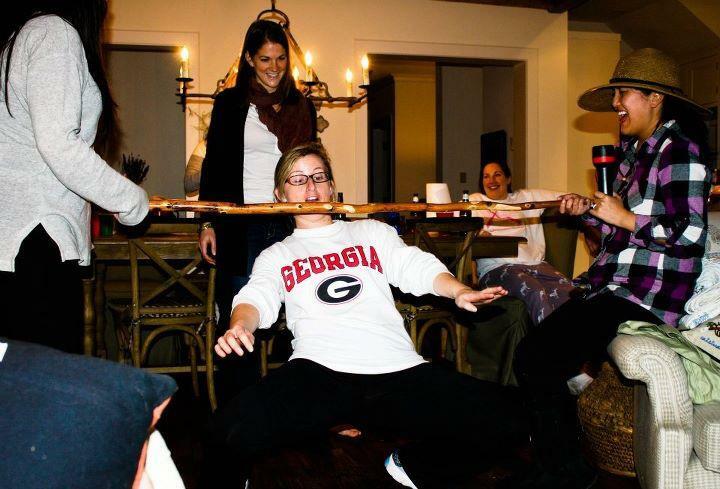 Who else goes fly fishing and plays limbo on their bachelorette?!? At his two month appointment, he weighed 11 lbs 7 oz.–more than 4 pounds up from his birth weight. It shows too, because his little belly is expanding and he’s quickly outgrowing his 3-month clothes, more in length than width. Just look at that cute belly! At every turn, and in every picture, JM seems to look a little different. His eyes have deepened into a dark gray, which probably means they’ll go brown or hazel eventually. The light hair on the top of his head has started to come in a bit, but the darker ring around the bottom has yet to fall out. He loooooves bath time, especially kicking around and splashing. But he haaaates putting clothes back on once it’s over. I think the Hobson men tradition of going shirtless is already influencing him. It’s crazy to think that I was stronger at 39 weeks pregnant than I am now. Back then, I barely broke a sweat doing 95lb deadlifts in a CrossFit workout. Now, they’re way tougher than they should be. It’s the same way with all my lifts. I’m not beating myself up about it too much. I’ve just got to take the time to build my strength up again. And of course it will help when JM starts sleeping more at night and I get more rest. I could live off homemade salads and soups indefinitely. I’m still on my salad kick and eat them for lunch about five days a week. No bottled dressing will ever do an amazing salad justice. Since my mom whipped up homemade balsamic dressing the week after I delivered, I’ve been hooked on making my own ever since. I’ve purchased a couple infused balsamic vinegars, which have been great additions. Who wouldn’t want to try pear, orange blossom honey or white raspberry infused vinegar? Now that I’m no longer pregnant, I really have no excuse to buy gluten-free processed foods. Sure, rice flour is better than wheat flour, but truly, almond or coconut flour is best. So this week I’m using up most of my processed gluten-free foods. The grilled ham and cheese sandwich, homemade cinnamon raisin french toast and double chocolate chip muffins have been amazing. Now it’s sayonara to them and hello to whole unprocessed foods. This $10 bottle of wine is very good for its price point, not that my palate is super refined. A half glass here and there is definitely a treat. Thanks for turning us onto it, Cam. And if you’re looking for an amazing poultry spice, try out this one, found in aisle beside the mexican food. We had it on chicken at a cookout a couple weeks ago, and I couldn’t get enough. Thanks Josh C.